SINGAPORE, June 1, 2015 — Unified Inbox launches UCaaS Global Developer Program for industry breakthrough UnificationEngine. Singapore-based Unified Communications (UCaaS) company Unified Inbox (UIB) has launched its first global developer program. To further its mission of simplifying communications, the program creates a new ecosystem for unified communications manufacturers and developers using Unified Inbox’s patented UnificationEngine. Over the past few years, as part of the transition from programming languages to programming frameworks, there has been a global move towards developer ecosystems for everything from social networks to productivity software to mobile apps. What’s driving this change is consumer demand and the rapid increase in the amount of time spent on social media and mobile/messaging platforms and apps. Developers are creating disruptive innovations by adding a new layer of functionality on top of existing communications platforms’ APIs. These channels include legacy communications channels like email, voice, and fax, over 60 different chat apps, and social networks. The one key issue with such development, however, has been the constantly changing nature of social networks’ APIs. This has had a critical impact on the stability of these new innovations which operate on top of the platforms’ APIs. This has resulted in developers wasting time and energy on changes required by API updates, rather than being free to fully invest themselves in their own products and ideas. For the first time, Unified Inbox’s UnificationEngine allows developers to use a small piece of code to simultaneously send messages to and receive messages from a large number of services, including company pages/walls, without having to worry about the the social networks’ and apps’ connecting APIs. This enables more efficient communications – developers no longer need to worry about the base APIs as the service, such as Facebook or Twitter, changes its APIs, as the changes will be handled directly by Unified Inbox’s service-agnostic UnificationEngine. Currently valued at at US$10 billion, the Uniﬁed Communications as a Service (UCaaS) market is forecasted to grow to US$25 billion by 2019. One percent of this rapidly growing market will be worth a quarter of a billion dollars a year in high-margin revenue. Microsoft, IBM, Cisco, Huawei, Siemens, Google, and Facebook are all investing heavily in UCaaS and related technologies – both their own and through acquisitions. Developers can sign up for Unified Inbox’s new Global Developer Program on Unified Inbox’s website at: https://unifiedinbox.com/partners/developers.html. The UnificationEngine Global Developer Program will be showcased during the CommunicAsia 2015 event in Singapore June 2-5, 2015. 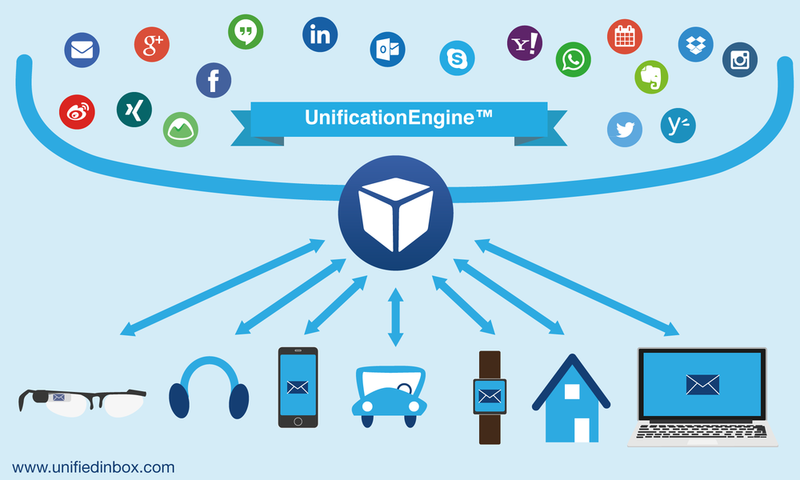 You can also learn more about Unified Inbox, the UnificationEngine, and its Global Developer Program on http://unifiedinbox.com or https://unifiedinbox.com/partners/developers.html.